Baskin-Robbins, the world’s most loved ice cream brand, welcomes the world’s friendliest superhero, Spider-Man, with special offers to celebrate his latest big screen adventure, the much-awaited Marvel blockbuster film, Spider-Man: Homecoming. Buy a double value scoop of your favorite of Baskin-Robbins ice cream flavor and get a free themed waffle cone upgrade! Promo runs until July 31, 2017. 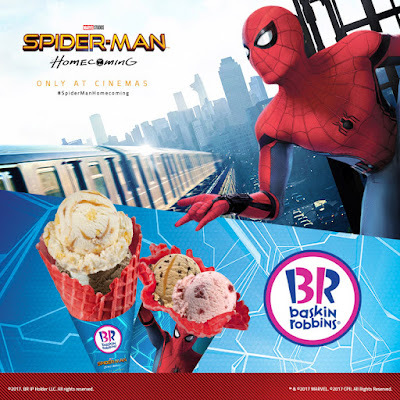 Baskin-Robbins pays tribute to the Spider-Man: Homecoming film premiere with its July Flavor of the Month, Movie Theatre Popcorn, buttered popcorn flavored ice cream with crunch clusters and a salted caramel ribbon. You can also celebrate the launch of your favorite Marvel film with Baskin-Robbins delicious cakes. Choose from a wide variety of designs, shapes and sizes and ice cream flavors, such as the new Cotton Candy n’ Cake, cake-flavored ice cream with cotton candy ribbon and cotton candy flakes. Celebrate with the rest of the world and join Baskin-Robbins in welcoming Spider-Man: Homecoming! For more information and updates on Baskin-Robbins, check out www.baskinrobbins.ph or their social media accounts: facebook.com/baskinrobbinsph, Twitter, and Instagram @baskinrobbinsph.